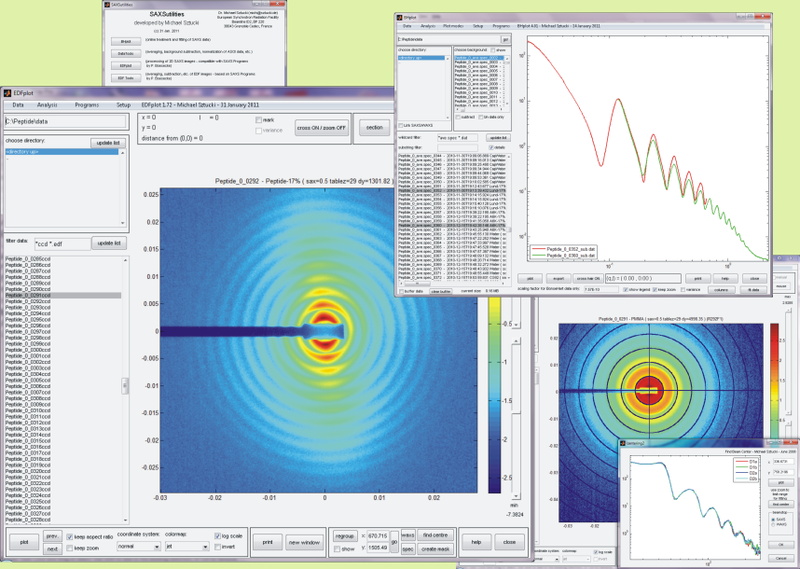 Matlab based graphical user interfaces have been developed for the online processing and analysis of Small Angle X-ray Scattering data. The described programs are available in a compiled version (not requiring a Matlab licence) for Windows, Linux, and Solaris. You will be asked at the end of the installation routine to download and install this runtime environment. The installation has to be done only once. This version might not support all features of the 64bit version!! New procedure since October 2013 (Matlab R2013b) !!! Add the environment variables LD_LIBRARY_PATH and XAPPLRESDIR to your system as indicated in the last step of the installation procedure. Note that this has to be done only once for each new release of Matlab. Add an environment variable SAXSUTILITIESPATH to your system which points to the directory created in step 1. Note that unspec by P. Mikulík has to be installed. Note that saxsprograms by P. Bösecke have to be installed. Start SAXSutilities from the folder created in step 1.